For manufacturing of home seating, garden furniture, car upholstery etc. 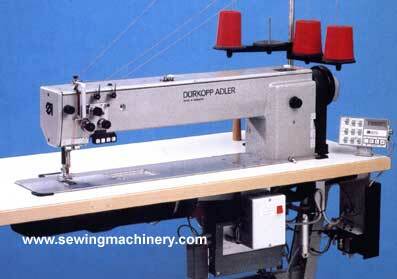 plus operations where a long arm machine is required for sewing in/on wide materials. The 467 - 65 allows the realization of stitched seams in upholstery pieces as well as selvedge and flat seams in awnings and tent planes etc., it features an extended arm with 650mm clearance. The excellent characteristics of the bottom, needle and alternating top feed may be improved considerably by combining it with an additional puller feed activated from bottom and top. The robust, low maintenance construction, the superior sewing results and the high production output make this machine the ideal operating equipment for its use in the medium weight application range. Special sewing equipment, devices and accessories for a single needle and a twin needle version guarantee its flexibility of utilization..